Since when did we decide that police officers should be above the law? Two of the biggest police unions in the country are now on record in opposition to free speech. They are on record against constitutionally protected free speech that opposes the epidemic of police violence across America (more than 900 killed by police so far in 2015). The event centered on victims of police violence . There is no doubt that police have killed unarmed, innocent people. There is no doubt that a few cops have been convicted of murder. The reality of police violence is beyond dispute and longstanding. It goes with the territory, and responsible police leaders everywhere know perfectly well that part of their job is not only to keep their officers safe, but also, and arguably more important, to keep the public safe from their officers. The question is why they do so little about police violence. In the aftermath of the Rise Up October rally, there were a reported 11 arrests, two of which on video show gangs of police roughing up single, unresisting men. Even though the demonstration was peaceful and had a lawful parade permit, police turned out in force. No police officers were reported hurt, except for their feelings. It’s no surprise that someone who makes a living glorifying crime and violence is a cop-hater, too. The police officers that Quentin Tarantino calls ‘murderers’ aren’t living in one of his depraved big screen fantasies — they’re risking and sometimes sacrificing their lives to protect communities from real crime and mayhem. New Yorkers need to send a message to this purveyor of degeneracy that he has no business coming to our city to peddle his slanderous ‘Cop Fiction.’ It’s time for a boycott of Quentin Tarantino’s films. Actually the police officers that Tarantino calls “murderers” are in fact murderers, which is why Tarantino called them murderers – because, although they are but a small percentage of the total police cohort, they have murdered people, mostly without significant consequence to themselves. On October 30, Lynch sent another press release featuring Tarantino’s father saying, “Cops are not murderers, they are heroes,” which is the police union party line. In reality, it should go without saying, most cops are neither murderers nor heroes. Like the first press release, this one also ignored the complaints of police brutality, but it omitted the proposed boycott, too. Just four days after the on-duty murder of a hero NYPD street cop, a rally in Washington Square Park against ‘police terror’ devolved Saturday into a raucous, law-enforcement gripe-fest. We fully support constructive dialogue about how police interact with citizens. But there is no place for inflammatory rhetoric that makes police officers even bigger targets than we already are. Film director Quentin Tarantino took irresponsibility to a new and completely unacceptable level this past weekend by referring to police as murderers during an anti-police march in New York. He made this statement just four days after a New York police officer was gunned down in the line of duty. New York police and union leaders immediately called out Tarantino for his unconscionable comments, with union head Patrick Lynch advocating a boycott of his films. We fully support this boycott of Quentin Tarantino films. Hateful rhetoric dehumanizes police and encourages attacks on us. And questioning everything we do threatens public safety by discouraging officers from putting themselves in positions where their legitimate actions could be falsely portrayed as thuggery. While this statement begins with support for “constructive dialogue about how police interact with citizens,” that very formulation betrays an imagined dichotomy between “police” and “citizens.” Police need to think of themselves as our fellow citizens. Worse, Lally immediately moves into his own unconstructive dialogue, mischaracterizing what Tarantino said, launching another ad hominem attack on Tarantino, and completely evading the substance of the Rise Up October protest. Worst of all, Lally reinforces the police-as-victim trope, which is a form of psychological denial. It’s not “inflammatory rhetoric that makes police officers even bigger targets,” its inflammatory behavior by police officers. Given the spate of police horrors since 1999, when NY police shot unarmed Amadou Diallo 41 times, it’s fair to wonder why police departments everywhere aren’t showing a whole lot more humility. Instead, the NY chief of police has given one of the four killers his gun back (after all four were found not guilty by a jury). We are not bitter. I told the world then, the day when they stood up and told me that the four cops who shot my son had done nothing wrong, that it was the fault of my son, I said to you, I say to you now, I said it then: We need change. Amadou has died. It’s too late for him. But we have to prevent this from happening again. When you have tragedies like that, you need to learn what went wrong and correct it…. Law enforcement community should know that we are not against them. We even feel for those who were shot just recently in Harlem. We are not against them. We are anti-police brutality. We are not anti-cop, because we know some of them are doing good job. But we need to root out those who are brutalizing our children for no reason. What should a police union be doing, anyway? The core issue with police unions, teacher unions, and all other public employee unions is how to manage the inherent tension between the good of union members and the good of the public that pays their salaries. Police unions, because their members are empowered to use lethal force, should be especially sensitive to the public perception of what is in the public good. That is almost never going to include killing innocent, unarmed civilians. 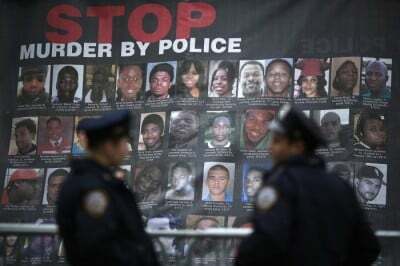 There is blood on many hands tonight — those that incited violence on the streets under the guise of protest, that tried to tear down what New York police officers did every day. That blood on the hands starts on the steps of City Hall, in the office of the mayor…. These comments set the stage for a symbolic police mutiny, as officers turned their backs on New York City Mayor Bill de Blasio at a press conference dealing with the assassination ambush. This is a direct challenge to civil order, open defiance of the mayor’s lawful authority over the police. And it is a gesture of arrogance, not only against non-violent protests of police killing, but in support of an above-the-law right to continue to execute civilians more or less randomly. Who is more deserving of protection, police or public? Mr. Comey said that he had been told by many police leaders that officers who would normally stop to question suspicious people are opting to stay in their patrol cars for fear of having their encounters become worldwide video sensations. That hesitancy has led to missed opportunities to apprehend suspects, he said, and has decreased the police presence on the streets of the country’s most violent cities. Wait a minute, that’s pure sophistry. If you have police officers afraid of becoming viral video villains, then you have police officers who are tacitly admitting that they are likely to behave illegally if not lethally. Police officers who act properly make boring videos that don’t go viral. The data is unequivocal. Police killings are a race problem: African-Americans are being killed disproportionately and by a wide margin. The evidence of racial bias in American life remains powerful and its effects are cruel and unusual. Perhaps the nation is less bigoted than it was in the past, but it remains a long way from being a place where all people are treated equally. And one of the grosser reasons for perpetual racial oppression is the willingness of powerful police unions to deny reality and blame the victims. Police unions need to reflect on the healing words of Kadiatou Diallo and put aside their bitterness. Police unions need to protect and serve the public, not the perpetrators of violence and death. How about: if you’re not careful enough to identify a toy gun in the hands of a child before you shoot to kill, then you’re not careful enough to be an armed police officer. That seems like a pretty low bar.